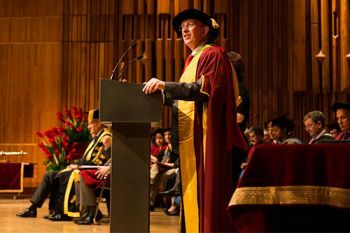 The Reverend Dr Martin Dudley, rector of St. Bartholomew-the-Great and Cass Business School alumnus, was presented with the honorary award of Doctor of Arts by City University London today. The Reverend Dr Dudley joined St. Bartholomew-the-Great - one of the City of London's oldest churches - in 1995. He is also Priest-in-Charge of St. Bartholomew-the-Less. A compassionate humanitarian, The Reverend Dr Dudley has devoted almost two decades of his career to the pastoral care of the London community. A respected scholar, he is widely admired in church circles for his knowledge of liturgy and for his intelligent preaching. At a time when many churches are experiencing declining congregations, one parishioner remarked to The Guardian: "He puts bums on pews". Born in Birmingham and educated at King Edward's School, Martin read Theology at King's College London and in 2006, studied Management at Cass Business School. Ordained into the Church in Wales in 1979, he has served in rural, suburban and housing estate parishes in Cardiff, Hertfordshire and Berkshire. Elected as a City councillor for the Ward of Aldersgate in 2002, The Reverend Dr Dudley has been an influential figure in shaping the local community. He has chaired the City's Community & Children's Services Committee and played a leading part in developing a new approach to service delivery in adult and children's social care, housing, education and public health. He played an integral part in establishing the City's Health and Wellbeing and Education Boards, and has chaired the former since its inception in April 2013, with a strong commitment to improving the health of the City's residents and its daily workforce of nearly 400,000 people. His involvement in the City extends to other prominent positions. The Reverend Dr Dudley is a governor of the Museum of London and a trustee of the Trust for London. He has served as governor of the City of London School for Girls and the City of London Academy Southwark. He has also been deeply involved in the development of the Square Mile's modern livery companies and is an honorary liveryman of the Hackney Carriage Drivers, past master of the Public Relations Practitioners and chaplain to the Information Technologists and the Tax Advisers.